Barrington impressed when it came to active learning activities available for the youth of their library. 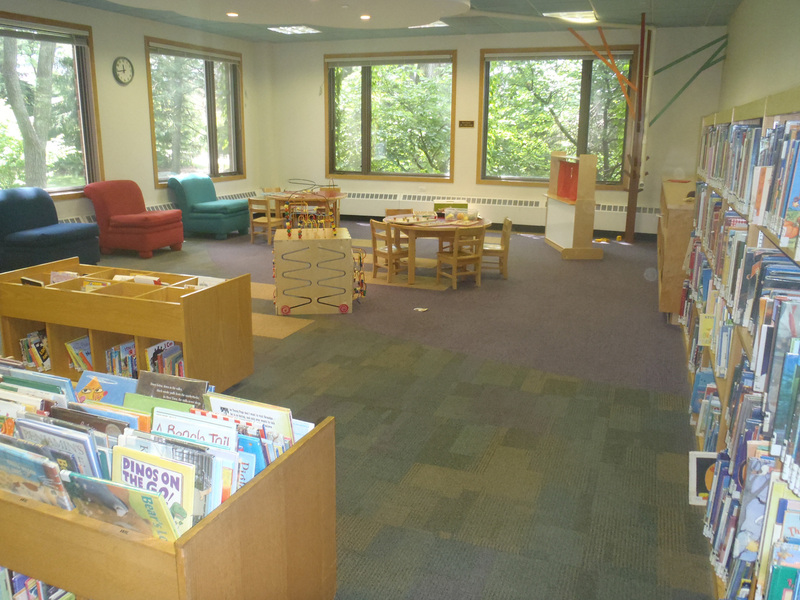 Spaces were well zoned to provide activities for all different age groups. They were deep in the throes of their popular summer reading program and participants of all ages were busy with activities throughout the library. Children’s books were primarily housed face out in browsing style shelving. A variety of active play furniture including a whisper tube, puppet theatre and even a mini book return encouraged fun in the process of learning. Tablet and desktop computers featured games and activities appropriate to the younger set. Tablets and computers are a popular spot for kids. Kids are encouraged to have fun and learn through play with a whisper tube, puppet theater, mini book return and other play stations. Fitting in with the theme of the Reading is Delicious summer reading program were a simple, yet creative, larger than life potato and ear of corn that greet children in the Children’s Area. The figures have a variety of facial features, shoes and hats that are applied via magnets and can be quickly and easily rearranged. Children are encouraged to search for the pigeon from Mo Wilhelms popular series of children’s books hidden with his hotdog on the children’s floor. A wall that encourages children to write their own response to questions “The Pigeon wants to know…” proves to be very popular as well. Technology is leading the way in this library as well with content creation being one of the newer possibilities at this facility. 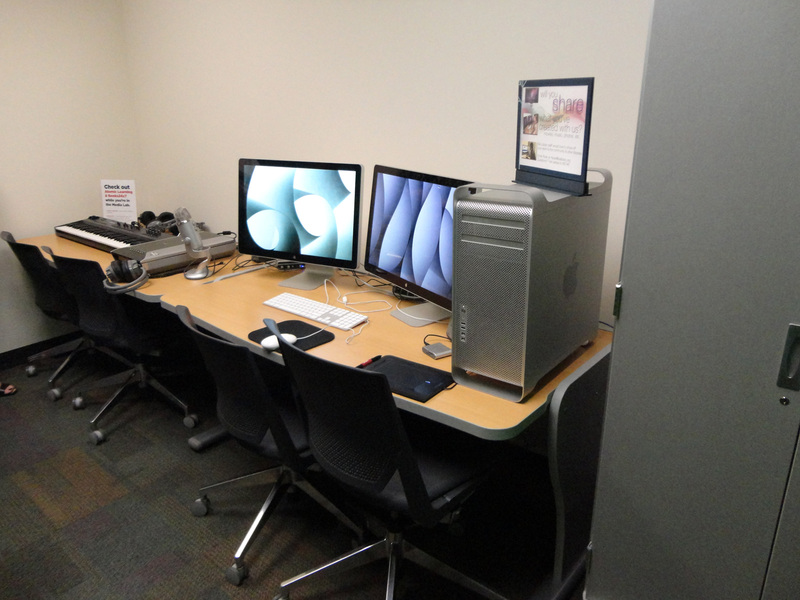 The digital media lab which became a reality in the Fall of 2010 features a variety of software and hardware to create and edit movies, music, photos and more. The labs have continued to evolve since they began adding new software and capabilities as they have been needed. Barrington also relies on online tutorials to help customers and staff with the technical training needed to use the equipment. 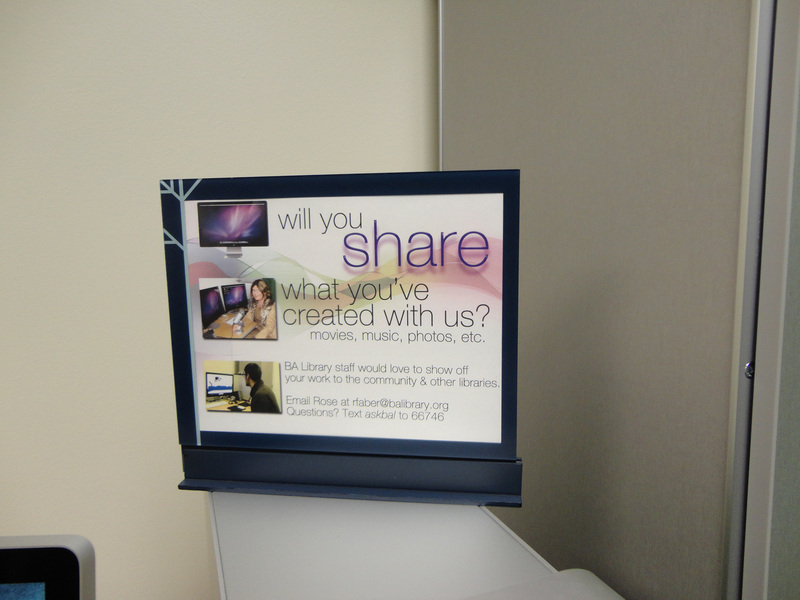 Signage within the lab encourages users to consider sharing what they have created for the enjoyment of all. Digital media productions takes shape in the media lab. Customers are invited to share their creations.